Amelia and family have arrived in Egypt for the 1911 archeological season--afterthe marriage of young Ramses' best friend David to Amelia's niece Lia. But trouble finds them immediately when David is accused of selling ancient artifacts. While Amelia and company try to clear his name and expose the real culprit, the body of an American is found at the bottom of their excavation shaft. As accusations of drug dealing and moral misconduct fly, a child of mysterious antecedents sparks a crisis that threatens to tear the family apart. Amelia brings her brilliant powers of deduction to bear, but someone is shooting bullets at her--and coming awfully close!Amelia and family have arrived in Egypt for the 1911 archeological season---after the marriage of young Ramses' best friend David to Amelia's niece Lia. But trouble finds them immediately when David is accused of selling ancient artifacts. While Amelia and company try to clear his name and expose the real culprit, the body of an American is found at the bottom of their excavation shaft. As accusations of drug dealing and moral misconduct fly, a child of mysterious antecedents sparks a crisis that threatens to tear the family apart. 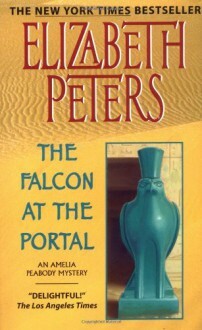 Amelia brings her brilliant powers of deduction to bear, but someone is shooting bullets at her---and coming awfully close!Amelia and family have arrived in Egypt for the 1911 archeological season---after the marriage of young Ramses' best friend David to Amelia's niece Lia. But trouble finds them immediately when David is accused of selling ancient artifacts. While Amelia and company try to clear his name and expose the real culprit, the body of an American is found at the bottom of their excavation shaft. As accusations of drug dealing and moral misconduct fly, a child of mysterious antecedents sparks a crisis that threatens to tear the family apart. Amelia brings her brilliant powers of deduction to bear, but someone is shooting bullets at her---and coming awfully close!